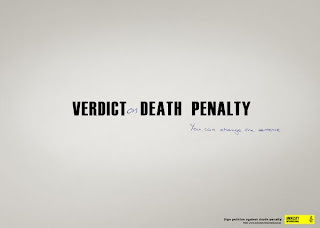 Today is the 9th World Day against Death Penalty, a repugnant penalty which denies people their basic right : the right of living, the right of breathing. So many times, people who were condemned to death proved to be innocent. Unfortunately, this happens after their execution.Too late ! I am against death penalty! I also hate the death penalty. But if someone is proved by evidence to be a killer of many innocent children and women, do, you accept him to be your neighbour? Won't you feel threatened and fear to go out at night because of this criminal? Another thing, I guess you are a muslim, and Allah says that if someone kills an innocent humanbeing intentionally, he must be killed. So we can not negotiate Allah's orders. Please read sourat Elbaqara to check by yourself and if you are not convinced speak with Islam scientists. We must not follow everything we find in the Western culture, we are muslims, we can adopt all Western life and thinking as far as they do not contradict the quran and Sunna. I will be glad to talk with you more about this and read your comment. My msn address is " spidernet2010@live.com "
Oh please Faysal stop writing such stupid things. Even if you place yourself under a strict sharia perspective, and even for intentional murder, retribution (qisas) can be changed into compensation (diyyat). It would be legally fairly simple to abolish death penalty by defining the acceptance of compensation as an ex ante obligation for citizens and residents and to determine also ex ante the amount for compensation. Compensation can be funded just like an insurance system. But of course you don't know any of this do you? Furthermore, Muslims are supposed to be wise and merciful, but you don't care, you just want to kill because you thought you read it in the Quran..That's just sad. As far as all the non sense about western culture and Muslim culture, let me just tell you that the USA, the leading western country are very active users of the death penalty. On the other hand, many non western countries have abolished the death penalty. Namely, Erdogan’s Turkey, the leading Sunni Muslim country which Tunisia islamists claim as their example to follow, abolished death penalty in 2004 (under Islamist Erdogan rule). So it is absolutely not a question of western culture versus Islam, it’s just a question of intelligence against stupidity. And as a matter of fact, death penalty is just absurd, there is no link between crime levels and use of death penalty. Furthermore, when innocent people are sentenced to death, it is just murder. What would you do in your wonderful system? Kill the judge?